Combo of red inner circle and black sclera give a horrific, Jigsaw inspired look. 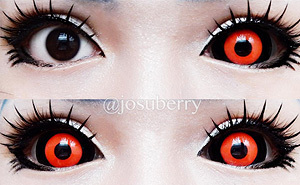 These lenses combine black and red colour giving you a striking, scary look. They are perfect for any Halloween party or a costume event, with them your outfit will be admired by everybody. As they cover the whole eye, they give you an amazing, freaky look. If you are a professional actor or like to dress up in a professional way, you absolutely need to wear Gremlin contact lenses , as they provide a Hollywood standard for your costume. These lenses are absolutely perfect for Tokyo Ghoul cosplay - wear one on your left eye and your Ken Kaneki costume will be almost complete!